Like shortbread, sugar cookies were a staple I thought I should be able to make using local sugar. This time, I stopped counting after trial batch number 6. While a nice tasting cookie was quickly achieved...a nice texture, not so much. These sugar cookies taste like sugar cookies, only extra delicious, and, when using a light honey, the honey taste is not discernable. Because of the extra liquid in my sweetener of choice, my initial cookie experiments were much too cakey, and the adjustments in eggs/fat/honey ratios took a few tries to get right. I eventually narrowed it down to two versions—one using whole eggs, the other using eggs whites. I made each a number of times, unable to decide...but after this last test, my unquestionable favourite uses whole eggs. I like the crisp edges, and tender center—egg whites made for a much chewier cookie. So, here it is...my baby. The basic sugar cookie recipe that would appear in my bakery...should I ever have one. 1. Whisk together dry ingredients, and set aside. 2. 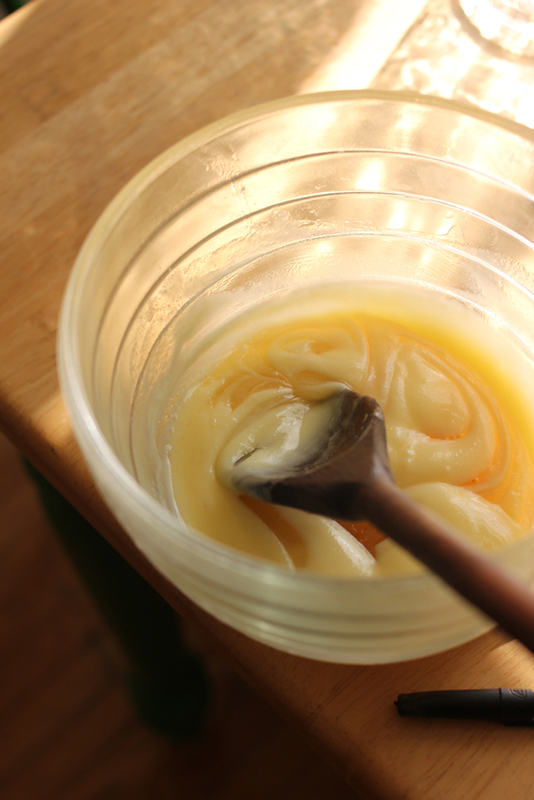 Cream ghee until light and fluffy. Add honey and beat until combined. 3. Add eggs and vanilla, and mix well until everything comes together. 4. Add dry ingredients to wet, and mix until just combined. 5. Divide dough in thirds and form discs. Wrap and refrigerate until chilled—about an hour. 6. Working quickly, roll dough to 1/2 to 3/4 cm thick, depending on desired crispiness, and cut out desired shapes. 7. Bake at 325F for about 10-12 minutes, until the very edges begin to turn golden. 1. If you prefer a chewier, flatter cookie, replace the whole egg amount with an equal amount of egg whites—this is James' preference. 2. If you are using intricate cooke cutters and want the cookies to maintain their shape as best as possible, refrigerate your cut out cookies, on the baking tray, for another 15 minutes before baking. I did not do this in the cookies pictured. 3. Rolling the cookie dough out between two sheets of plastic wrap is helpful to prevent sticking. 4. I have halved, thirded and quartered this recipe, because the full recipe makes a lot of cookies. I gently whisk an egg in a small dish, and take whatever amount of egg I need from that. WANT! My period is coming (sorry other blog readers) and, it follows, I have been craving snack foods all day. These look delicious and make me wish I hadn't looked at your blog just now. The pictures are making me… less strong. These remind me of the cookies my parents used to buy for us on Valentine's Day. One of my favorite things. I'd love to try these! So pretty and good! They are beautiful! Perfect for V-day dinner dessert. 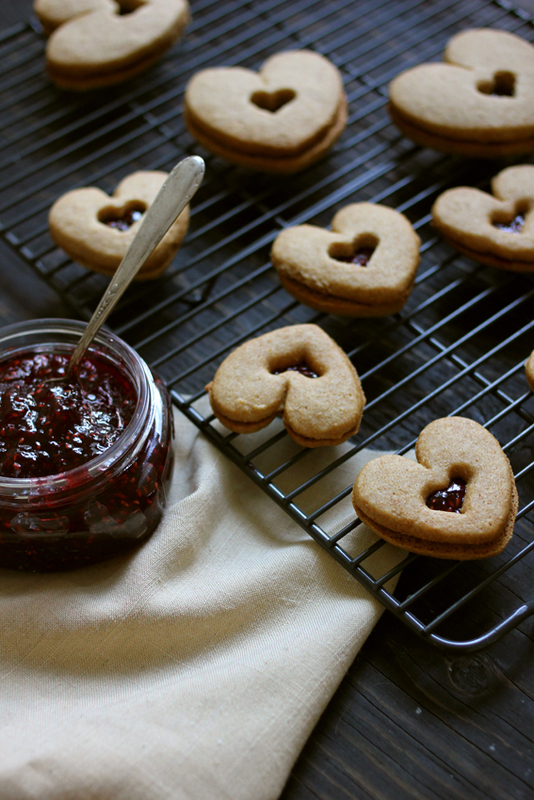 These look gorgeous, and I love that they're made with honey and whole wheat flour too.